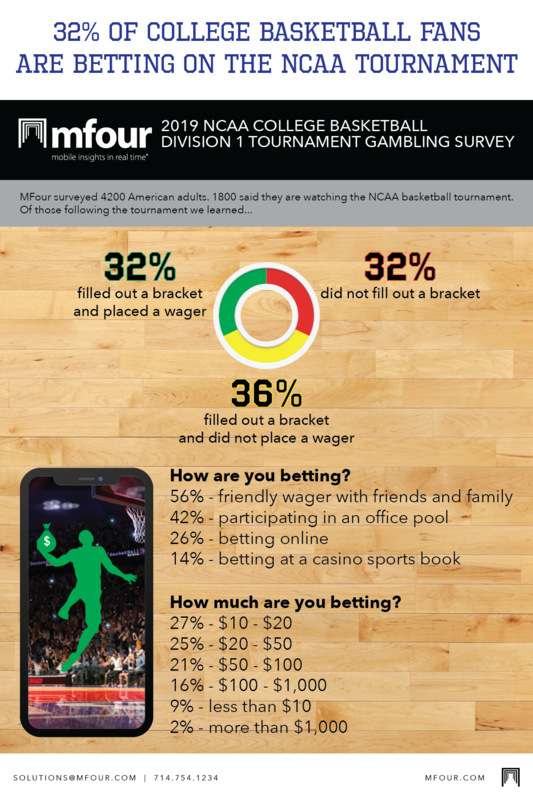 Nearly 30% of 21- to 64-year-olds who responded to a survey by MFour Mobile Research said they have filled in a tournament bracket for the NCAA men’s basketball championships, and 14% are betting on the annual March sports ritual. The study surveyed 4,200 U.S. residents nationwide, including 1,800 NCAA basketball tournament fans and 2,400 non-fans. Fans were defined as those who said they’re planning to watch the tournament. Among those watching the tournament, 32% said they’re also betting. Among those who said they’re betting, 26% reported using online betting services. 14% of bettors said they’ll place wagers in person at a casino sports books. 56% of those making bets said they were informal wagers with family or friends. 68% of people watching the games said they had filled out a tournament bracket. But 53% of bracket-players said it was just for fun, no money involved. 18% of bettors surveyed expected to wager $100 or more. 21% said they would bet $50 to $99. 25% planned to wager $20 to $49. 37% said they would wager less than $20. 17% of tournament-watchers said they’d be watching at work. 67% of at-work watchers said it’s OK with their supervisors. 33% said it’s against the rules, but they’ll watch at work anyway and try not to get caught. Of those with permission to watch in the workplace, 56% will do it on a shared office TV screen. The eight-question survey was fielded March 21-24 to U.S. consumers ages 21 to 64. All respondents use Surveys On The Go®, MFour’s mobile market research app, to take surveys on their smartphones or tablets. MFour received initial responses from 4,214 consumers who were representative by region. To indicate interest in the tournament, they were initially asked whether they planned to watch tournament games. The 1,810 respondents who indicated they were watching the tournament went on to complete the survey, providing answers about their plans for wagering and viewing.